The Ford Motor Company is recalling its full sized pickups due to a problem with an engine block heater. The recall involves approximately 874,000 trucks. More specifically, the recall applies to 2015 to 2019 F150, 2017 to 2019 F250, F350, F450 and F550 “Super Duty” models. The problem with the heater is actually in the heater connector cable. Water and other contaminants can get into the connector causing corrosion to occur and subsequently short circuit the cable. Short circuiting of the cable can lead to a fire. Dealerships will inspect and repair or replace the cable, at no charge. The recall was expected to begin on January 7th of this year. For additional information, consumers can contact Ford by calling 1-800-392-3673 or visiting www.ford.com and clicking on recalls at the bottom of the page. Ford’s identifying number for this campaign is 18S45. Just completed two webinars; one on the use of glycols as heat transfer fluids and the other on retrofitting pumps in HVAC applications. Both of these topics are related in that pumps are used to circulate fluids, including glycols, to transfer heat. Typical applications for glycol use include the food and beverage industry, HVAC, and process chemical. Pumps applications not only include the previously stated industries but also, utility; both electrical and water, petrochemical, and plastics, to name a few. Insurance carriers that cover businesses in these industries need to be concerned because property damage as well as personal injury can occur when spills and pump failures occur. Corrosion is a major problem in systems using carbon steel piping as a conduit for the transmission of the gylcol. If not properly mixed and the correct inhibitors added, the glycol solution can be acidic and cause wear to occur in pipes and fittings resulting in leaks and spills, if not carefully monitored. Similarly, the internal components of pumps can come under attack and fail as a result of the acidic conditions that could arise if the glycol solution is not properly mixed. However, during such instances, insurance carriers are also considering the possibility of subrogating against a third party in order to recover their expenditures. Potential defendants would include the company mixing and/or installing the glycol solution, the designer and installer of the piping system, and the selector and installer of the pump used in circulating the glycol. It should be noted that the internal components of the pump can be selected based on compatibility of the fluid to be circulated. Hyundai Motor Company has announced that it is recalling approximately 600,000 vehicles in two recalls. The first recall involves 2013-2017 Santa Fe and Santa Fe Sport, about 437,400 vehicles. Corrosion can attack the secondary hood latch and cause it to malfunction. More specifically, the actuating cable can bind causing the hood to open while the vehicle is in motion. The recall will begin June 30 with Hyundai notifying owners and dealers replacing the hood latch free of charge. The second recall applies to 16,074 Hyundai Genesis and Sonata Vehicles manufactured between 2015 and 2016. Corrosion is also to blame for attacking the parking brake switch. As a result, the parking brake light may not illuminate if the driver does not realize that the parking brake is applied. This recall will also begin on June 30 with the notification of vehicle owners. Again, dealers will repair the affected vehicles free of charge. For further information on either of these recalls, owners can contact Hyundai by calling 1-888-327-4236. 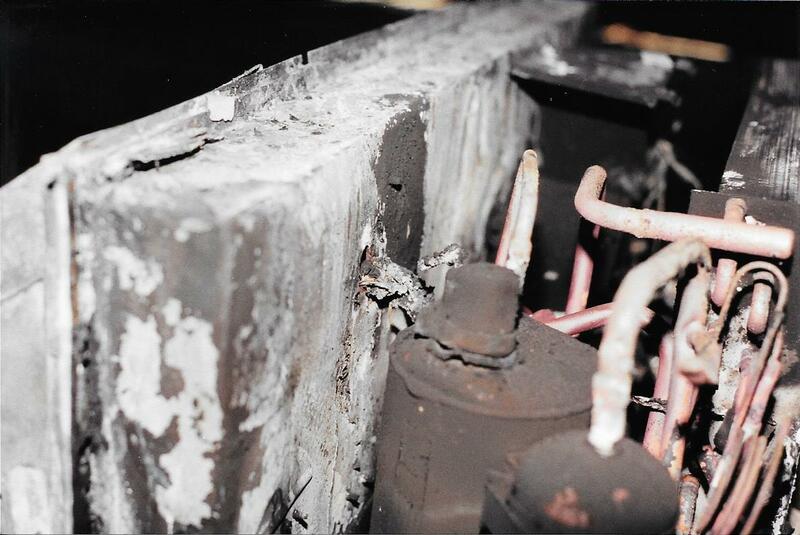 In keeping with the previous post on fire and appliance safety, photographs of some items that have been encountered in previous fire investigations are posted here: the first photo shows an electric stove where the fire originated in the control panel. 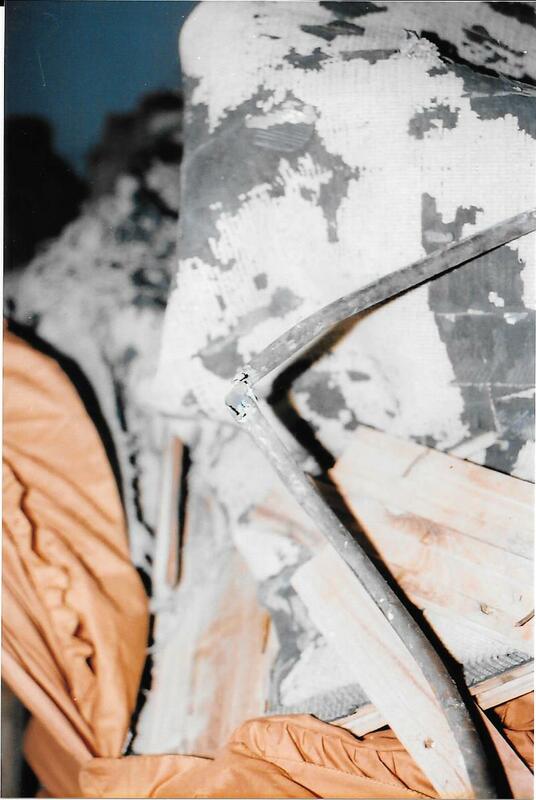 The next photo shows a packaged a/c unit damaged by fire as a result of contact made between a live wire and the edge of an opening in the metal casing. 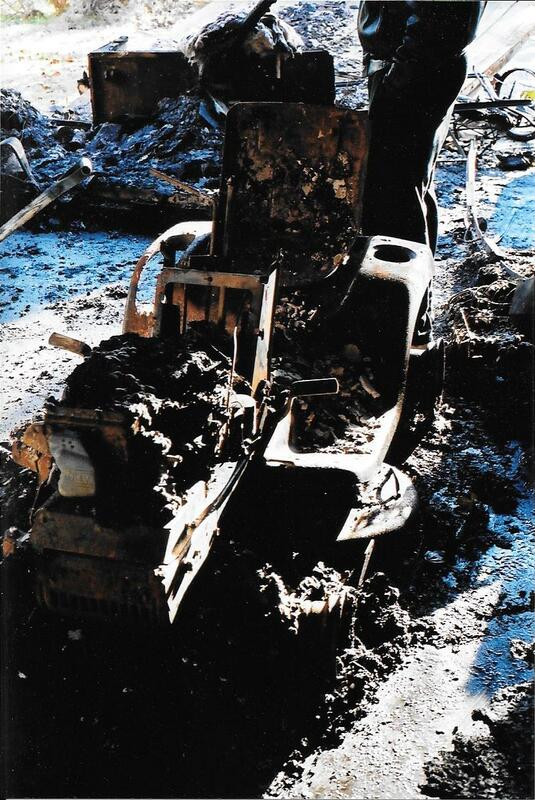 The third photo shows a riding lawn mower that ignited, most likely, by the owner’s failure to keep the machine clean between cuttings. 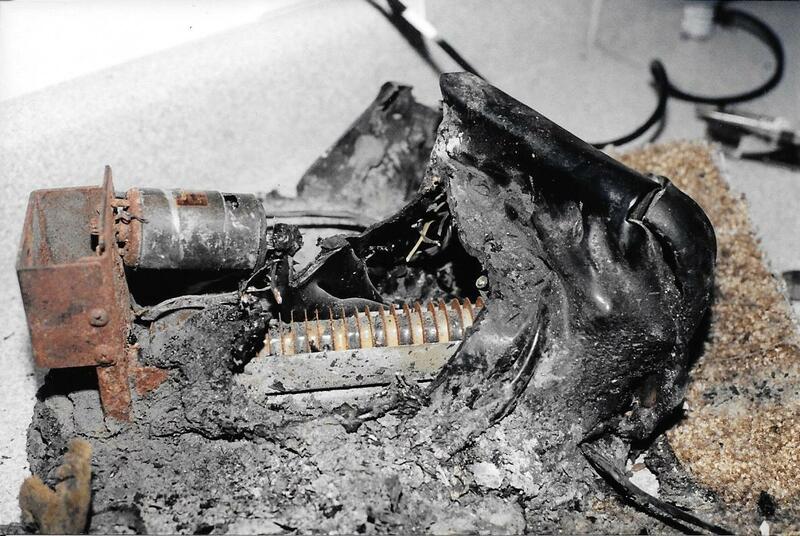 The next photo is of a paper shredder, also burned, because the machine was not kept clean. Dust created by shredded paper is just as flammable as any petroleum based fuel if the right conditions exist for ignition. 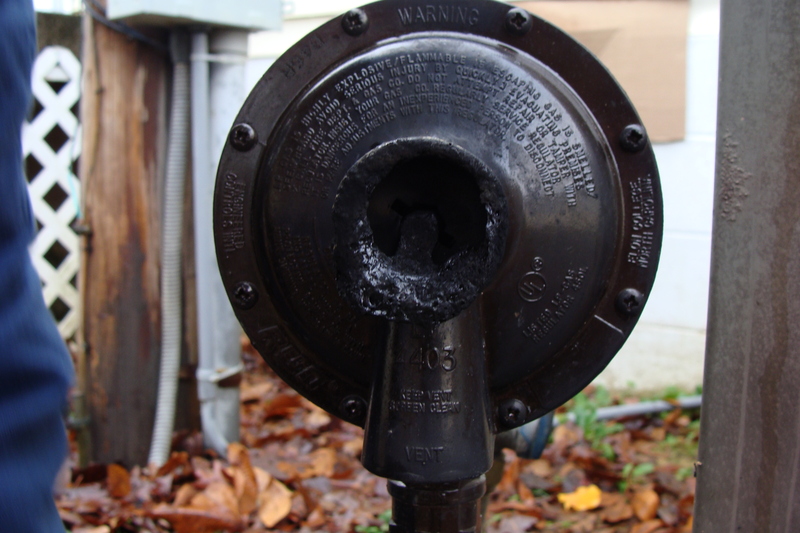 The propane gas regulator shown below was installed backwards so that gas was flowing into the outlet port and existing through the vent port. Since there was no pressure regulation, the cap covering the adjustment, (located in the center) was blown off and the escaping gas ignited. The homeowner happened to be standing nearby and was severely burned. 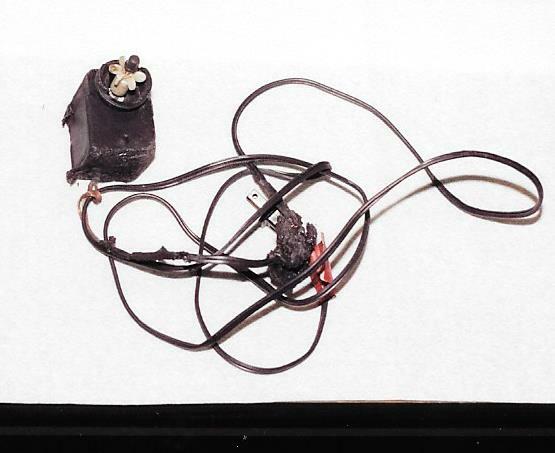 The next photograph shows a line cord attached to an aquarium pump. The problem was identified as a faulty line cord that was not properly sized for the continuous operation. As a result, the line cord insulation melted and ignited. 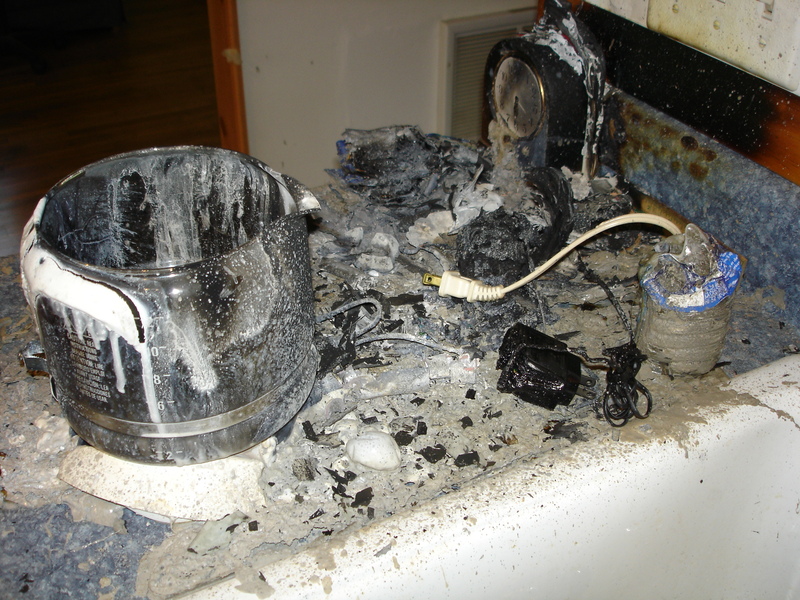 The following photograph shows a coffee maker that ignited and caused a small kitchen fire. 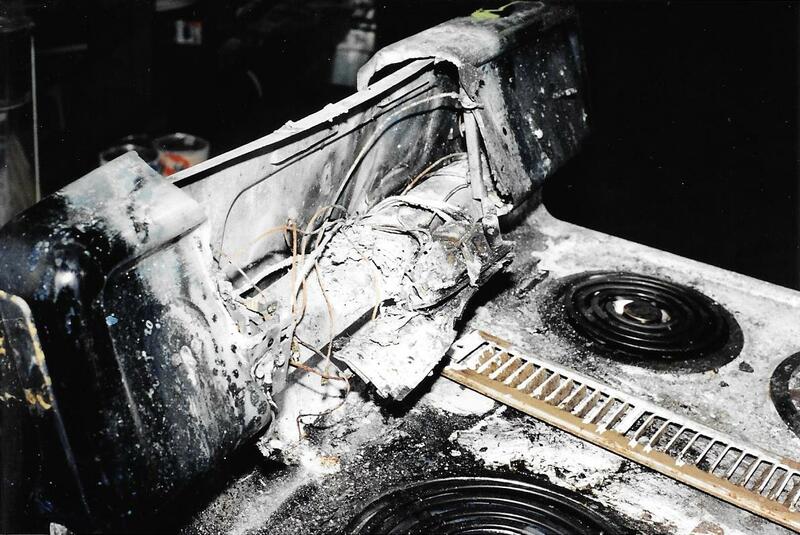 This appliance was destroyed badly enough so that the actual problem was unidentifiable. The pipe flange in the next photograph cracked after having been in use for several years. The leaking gas percolated up through a homeowner’s lawn and ignited; destroying the home as well as damaging a neighbor’s house. 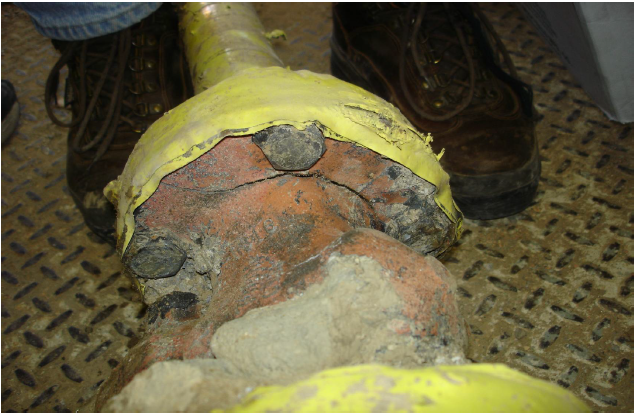 Corrosion of the copper gas line resulted in the leaking of propane gas and a sudden explosion. The explosion destroyed a residential structure. The Ford Motor Company has recently recalled 1998 to 2003 Winstar vehicles due to a problem with the rear axle. It seems that corrosion can attack the axle and cause it to break. When the axle breaks, the driver can lose control of the vehicle and crash. It seems to me that as long as Ford has been in business, the company has gained enough experience to know how to protect the vehicle, in general, and, the rear axle, in particular, from the effects of corrosion. It is well known that in climates where salt is used to melt ice, the resulting residue can corrode the undercarriage of vehicles not protected. So, how is it that a car manufacturer, who has been building cars for longer than most of us have alive, puts out a product that is not protected against a well known corrosive medium? Consider for a moment that the Windstar is the only vehicle in the Ford family of cars and trucks that is subject to this problem. Ther aren’t any other recalls for a Ford manufactured vehicle wth this problem. From Ford’s viewpoint, Ford believes that owners of Windstar vehicles who are experiencing rear axle problems are trying to get out of paying for expensive repairs by filing claims against Ford alledging a defective product. Why couldn’t the Windstar be defective?